Other photos: Underway, At Sea, At Sea, Starboard Side View, Anchord in Bay, At Sea, In Port, Anchor Winch, Foredeck Sunbathing Area, Foredeck, Flybridge Sunbathing and Dining Area, Flybridge Helm, Aft Cockpit, Aft Cockpit Dining Area, Saloon, Saloon Seating, Dining Area, Dining Area, Lower Helm, Lower Helm Console, Galley, Galley Access, Galley, Master Cabin, Master Cabin, En Suite, En suite, Guest VIP Cabin, Head, Twin Cabin, Head. This Ferretti 80 RPH Raised Pilot House was built in 2000 and since than maintained to a very high standard. Early 2015 the yacht underwent extensive upgrades and maintenance. Accommodation for 8 guests in 4 cabins and room for 4 Crew. On this yacht, an owner can combine all the luxuries of home and all the pleasures and freedom of vacation in a yacht of outstanding performance. The size of the Ferretti 80 RPH has been carefully selected to remain under the 24-meter limit where the tax authorities of many nations rule that a leisure craft becomes a pleasure craft and is thus subject to a different tax regime. With its length of 23.98 meters, the 80 is in the leisure craft category. The Ferretti 80 RPH knows no limits when it comes to setting standards for pleasure yachts. The normally accepted gap between top speed and cruising speed has been reduced, and this means that the Ferretti 80 RPH can guarantee a performance which will match its exclusive role as a compact superyacht. The engine room is in a better position and the fuel tanks perform the dual role of holding fuel and acting as a sound barrier from the master cabin. The crew cabins and the auxiliary room have been given a more practical layout. Another improvement allowed by the increase in size is to keep the mooring area aft separate from the cockpit so that the guests can watch undisturbed. This type of detail, of constantly striving to improve the quality and design of the Ferretti motoryacht, is what keeps Ferretti ahead. 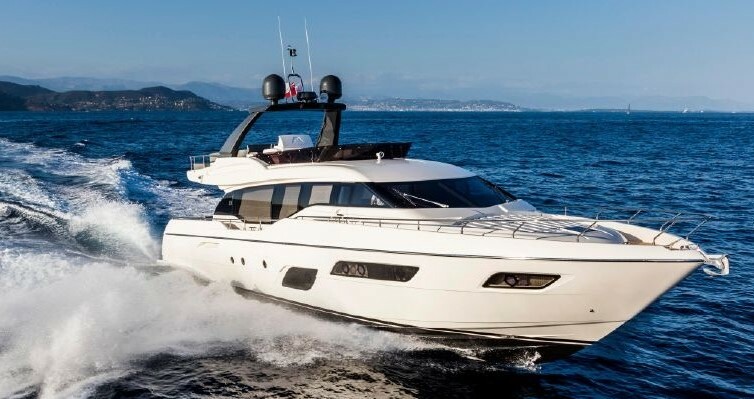 In five years, 38 prestigious Ferretti 80s have been delivered. SYS Yacht Sales is pleased to assist you in the purchase of this vessel. This boat is centrally listed by Volante Yachts.